mmm news | MMM dance for all, all for dance. The exercise method that promotes well-being. MMM dance for all, all for dance. The exercise method that promotes well-being. What are they saying about MMM Summer School? MMM held it’s annual weeklong dance Summer School in the fine premises of the University of Chichester. This year it was possible to award several bursaries for selected teachers to attend, with the aim of forwarding their continuing professional development as well as profiting from their experiences. Additionally, it was also possible to award bursaries for students, providing an otherwise rare opportunity to enjoy and benefit from the variety of classes and attendees in an international environment. I love the fact that there is so much history to Margaret Morris and that there is always information available on campus to see, and people to talk to about the history with people who are in fact PART of that history. En effet, la summer school m’a servis à parfaire ma formation. Enseignante en France, je n’ai personne pour me donner des cours et qui n’avance pas, recule. Beautiful moments, great experiences in a lovely and familiar atmosphere! I really want to come next year and meet you all again. I have gained so much from this year’s summer school, in particular I have picked up on many improvements for my technique thanks to the brilliant teachers. My plan for MMM in the future is to teach all ages and to contribute to keeping the movement thriving. My project is to continue my studies in psychomotricity and do the therapy exam.. maybe open a MMM course in Italy! I feel stronger than before. This experience brought me one step closer to myself and happiness. In the MMM (Margaret Morris Movement) book the description of this movement is: Recreational, Athletic, Creative, Therapeutic. I clearly felt all these aspects in the extreme. 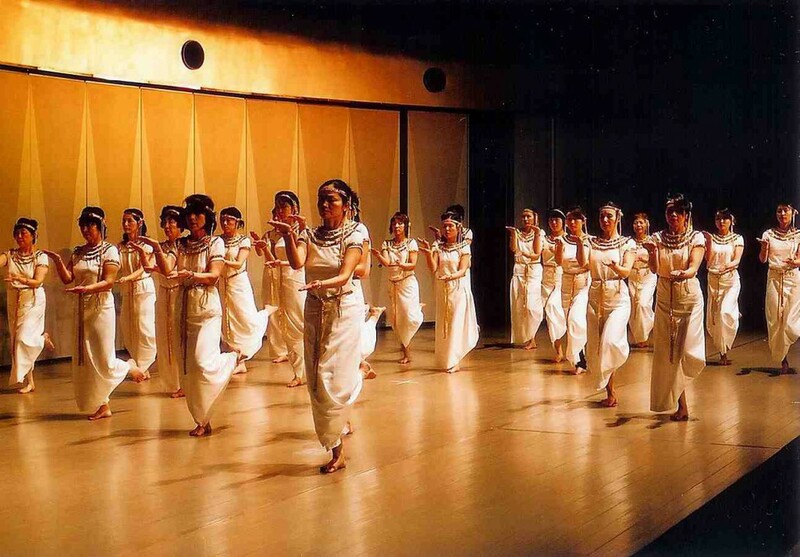 … watching Tricannon (a dance form created by one of Margaret’s students) and partaking in Chant Hindu really gave an understanding of dance as an art, demonstrating Margaret’s influences and scope, and giving the opportunity to experience first-hand the dances and costume (for Chant Hindu). So my plan is… To start work ASAP on Health Play qualification… To get my Basic Teachers Exam eventually… I feel I would like to assist those, just like me, with an urge to dance and move about and improve their health. 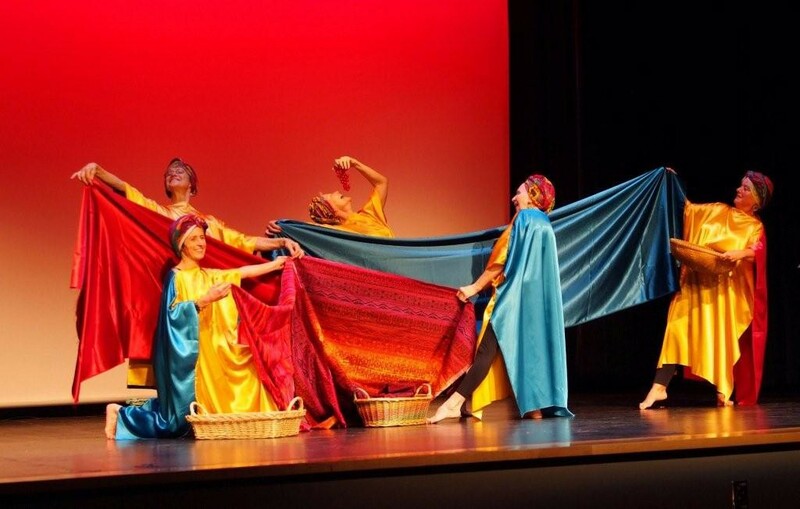 To meet others and discover the variety of people each with their own connection and share in that experience is one of the many reasons this dance movement is so special; I know from the week that I am not alone in my feeling of MMM as an extended family. By the week’s end, I felt a greater determination, connection and purpose despite going our separate ways. … This week has given me a confidence I hope to share with the wider world and show people the uniqueness of MMM. MMM were delighted to once again be able to hold their International Summer School (2015) in the University of Chichester. 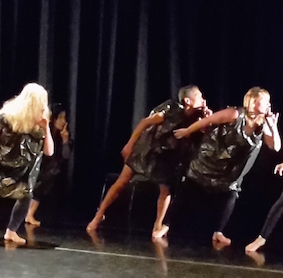 The campus has numerous dance spaces for classes and two performance studios for the end of week show, making it the ideal location. SOUTH OF NO NORTH, an exhibition of new and existing works which reflect varying approaches to art as performance, or performance as art. organised and run by Sara Lockwood and Chantal Bréavoine, which was something quite different and most enjoyable. So I was pleased to hear that the Scottish/French alliance was planning to go back to Kilquhanity (pronounced “Kilwanity”) for a second year. My curiosity and a real desire to attend a course at which I would not be teaching were in the back of my mind as I made my travel arrangements for April, allowing for the weekend in Scotland before returning home to Germany. Research in Google had shown that Kilquhanity was in quite a rural location, and Sara’s excellent pre-course information confirmed this – so her quiet warning that the mobile phone network was not too reliable set me wondering whether I could last for four days without being able to go online. Or maybe this was just another deliberately arranged detail of this idyllic location that Sara and Chantal had chosen, among other reasons for its historic importance for MMM. Two full days of creative work lay ahead of us as we gathered on the Friday afternoon and got to know each other (quite a group from England, and a lot of lovely Scottish ladies, some of whom were quite new to MMM), the studio, the three houses where we were accommodated and the plan for the weekend. Not to mention the wonderful catering provided by Jools, a local caterer who completely spoilt us all weekend. That alone would have been reason enough to be there, enjoying the sunshine and mild Spring temperatures. 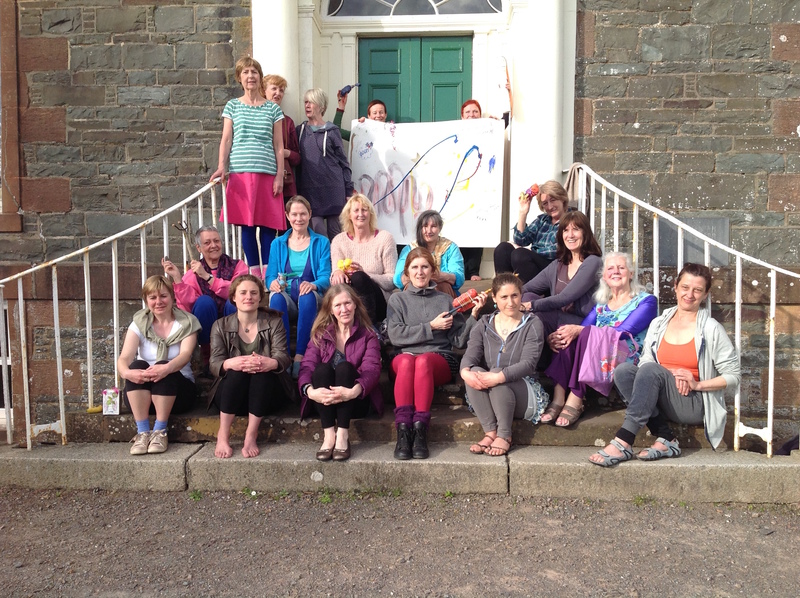 The programme was cleverly built up around the central theme of Rhythm, Sound and Music Composition as described in the book “Margaret Morris Dancing” and both teachers had prepared themselves thoroughly, with interesting classes involving sounds and rhythms which we made ourselves from materials found in the abundant nature around the studio. Jan Houselander also gave a class each day providing us with a break from the main subject, enjoying some fun MMM in between. A well varied programme was rounded off by relaxing evening sessions in the lounge – the final one finishing off with some – dancing, what else? Killy was a delightful experience and an all-round success. Returning home to Germany the next day made me realise how far away from my normal life I had been over the weekend. I hope that Sara and Chantal will find an equally fascinating theme for the next episode of the course, as continue they must. Having had the privilege to train with the late Jim Hastie, his belief in me opened up wonderful teaching opportunities. My teaching started in London, England and over the years it has expanded to many countries around the world. I have seen wonderful places with invitations to teach in France, Switzerland, Canada, Germany, Greece, Australia and Japan. I am always thrilled to experience the contrasting cultures. Often, I am also lucky to be escorted off the beaten track to places of beauty or history by a local who is proud to educate me in the wonders of their country. 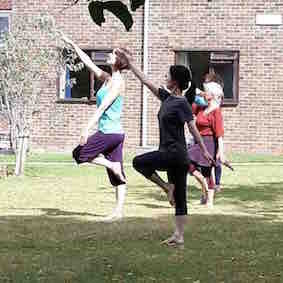 In each location I see eager faces and bodies willing and wanting to learn about MMM dance, its history and technique. It is universal and all are eager to progress, to see what the next challenges bring and get lost in the love of dance – I hope that this never changes. I have been part of many exhilarating MMM gatherings, and am reluctant to point to individual experiences, as they have all been so fabulous. I can’t believe how lucky I have been, and am grateful to all who have invited me to teach. Their generosity, kindness, support plus the many excursions outside of teaching made each occasion unique. From every trip I bring home a memento to hold the experience close to my heart. Dance training with MMM is just a start and is accessible to anyone who has a love for movement, but for those with teaching potential, it can open up a world of experiences. So start your training now – the world is your oyster. 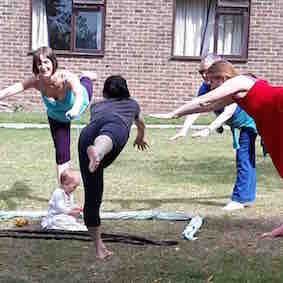 My positive life experience is through an exercise and dance programme that is a fusion of movement and breathing at a level of discipline that feels comfortable for ongoing mental and physical fitness. This discipline is over 100 years old. It is called MMM (Margaret Morris Method). 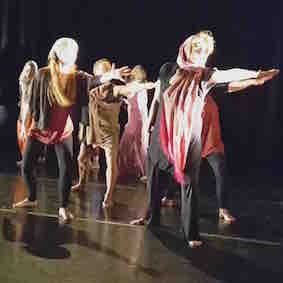 The MMM membership is blessed with a variety of artistic and creative dancers. Here is the story of one of them. When I decided in my retirement to offer MMM classes they did not go well. It was hard to attract participants to something that was not understood. There was much competition in the small town where I now live. Many activities were offered to the public that are well known. By the time I arrived at summer school in 2010 at Chichester I felt defeated. That was my state when I came across a book on Lucia Joyce, daughter of James Joyce. It was a hard cover book with wonderful pictures including some lovely ones of Margaret Morris. I learned she had taught Lucia Joyce at one point in her thwarted career. That’s what I discovered reading the book. Instead of pursuing her muse she was compromised for the sake of her father’s writing career. My heart went out to her. I felt great empathy. I emailed the professor who had written the book saying I thought if Lucia had been allowed to continue with Margaret Morris, who served as a den mother to the young woman, she would not have ended up in an asylum for most of her adult life. Lucia could have been successful as a teacher of little children. My imagination filled in an alternative life for her. So being a writer as well as an amateur dancer, I started to construct a novel. For years I wrote and had my work edited but failed to find a publisher. Then I learned that the professor whose book had inspired me had been sued by the grandson of James Joyce because he didn’t like how she had portrayed his family. Yikes! Had I wasted my time? I felt like that young woman with a thwarted career in dance and writing. Fortunately things have changed. The estate can no longer sue because the works are now in the public domain. My decision to publish my novel as an ebook was based on my thwarted career as a dance teacher and novelist. We are all products of our time. Ebook publication is a cheaper route than print. It is available worldwide so can reach dancers who are also readers everywhere. At the heart of Isadora & Lucia is the story of a young woman becoming educated and gaining independence. It is also the story of someone finding her muse and following her heart while working in Oxford, England, and travelling in Northern Italy. 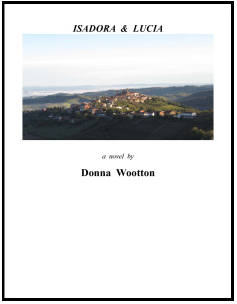 Isadora & Lucia, a novel by Donna Wootton can be purchased on http://dmwauthor.wordpress.com and clicking on the book cover. Monday November 10th 2014 An evening of talk, exhibition, art and music. Through J.D. 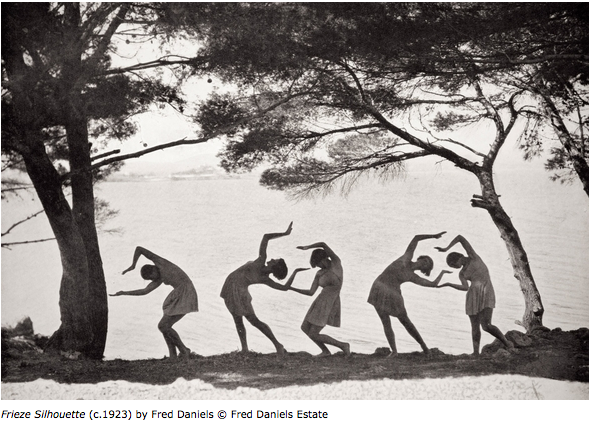 Fergusson, MMM has a great connection with Ballets Russes and it is embedded in its history. “…they were the greatest nights of anyone’s life.” Renowned Scottish colourist J. D. Fergusson whose art, along with that of Matisse, Picasso, Rodin, the Futurists and many more major 20th century artists, was inspired by nights out at scandalous Ballets Russes productions in Paris.